Enjoy a sun filled value holiday in Alanya by booking your stay at the comfortable and friendly Grand Okan Hotel. 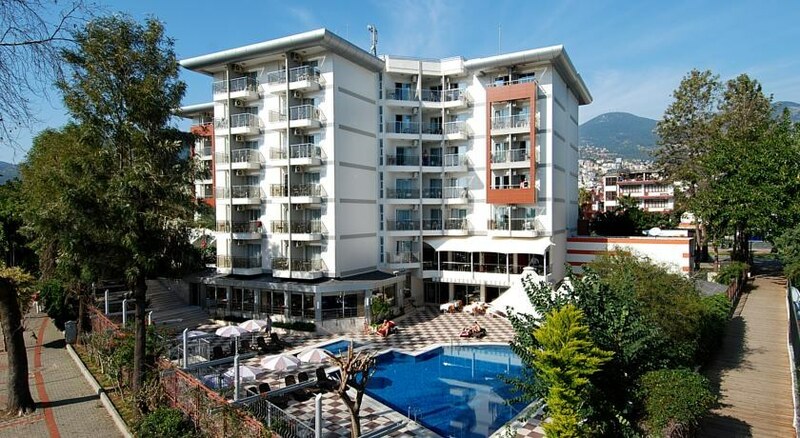 The Grand Okan Hotel is located in the popular summer resort of Alanya on the beautiful Turkish Riviera. 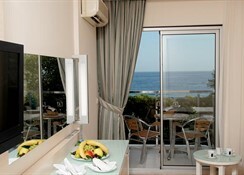 This charming hotel is situated right on the Cleaopatra beach, and only 1 km from Alanya centre. Surrounded by the Toros Mountains and the sparking blue Mediterranean, this is a great hotel for couples and families with 151 attractive rooms with modern amenities. Guests to the Grand Okan Hotel can discover marvellous beaches, explore delightful villages nearby and experience real Turkish hospitality. For a memorable holiday in Alanya, the Grand Okan Hotel is a perfect choice! The Grand Okan won a Holiday Check Top Hotel 2011 award for service, the hotel was rated to be in the top 40 in the world for service. Antalya Airport is 125 km from the Grand Okan Hotel. The facilities at the Grand Okan Hotel offer everything you need for a relaxing holiday. Food, drink and entertainment: Outdoor and indoor restaurant fully air-conditioned with smoking and non-smoking areas, Pool Bar open from early morning until the early hours, snack bar by the pool offers a delicious variety of small snacks or large lunches, the Mey Bar open all day with large screen TV, and the Beach Bar snack bar offers a light menu. Evening entertainment is 3 times a week including live music, leather show and Turkish folklore and dance. Sports, games and activities: Freshwater swimming pool, sun terrace with sun beds and umbrellas, separate childrens pool, billiard table, table football, darts, table tennis, beach volleyball and a variety of water sports on the beach. Sauna and massage are also available. Additional: Reception, 24 hour Internet cafe, beauty centre, parking, laundry/dry cleaning facilities, photographer, generator, 2 lifts, 24 hour room service and Doctor on call 24 hours. Baby beds and baby high chairs available free of charge. Air conditioned meeting room with a capacity for 100 persons (flipchart, projection equipment). 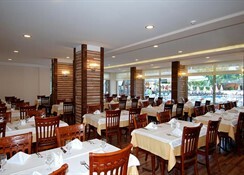 The Grand Okan Hotel features 150 standard rooms, 2 rooms especially adapted for the disabled and 3 Exclusive Rooms. All rooms have laminant floors, individual air conditioning, balcony, Satellite TV, music channels, direct-dial telephone, Free WI FI connection, rentable safe , bathroom with shower and hairdryer and telephone. 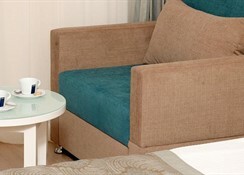 Rooms are facing the famous Taurus Mountains or sea and pool view. Promo rooms are standard rooms located on the lower floor facing inland.